Swipe left and right to navigate through the tour! TeamPages looks great on all devices. 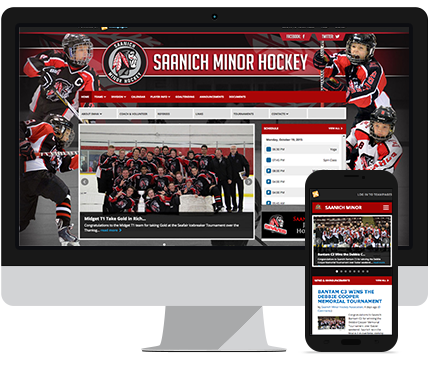 Whether you're on an iMac or a phone - your site will look great. Choose from multiple templates, pick colours, and upload custom banner and background images. Create custom content using our simple text editor. Add text, images, links, and more! Embed custom widgets onto your home page. yoursubdomain.teampages.com is provided for free. If you want your own domain, you can purchase it from us at teampages.shopco.com or any other provider and we’ll set it up for you. You decide what content you want on your site, and who can see it! All of our features can be turned on and off at the click of a button. Our mobile apps are available FREE for both iOS and Android. Add new events and send out event invitations. 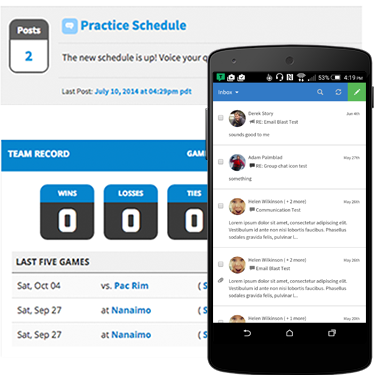 Track attendance and score games right from the field. Manage your teams and add roster members. View contact information for your players, parents, and coaches. 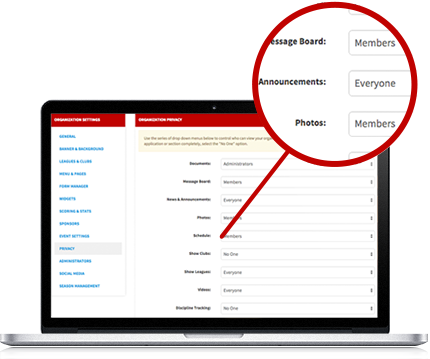 Send and receive messages to one or many members of your team and participate in group chats. Send and receive push notifications about important updates like event changes or cancelled games. Team communication is the key to a successful season. Keep your entire team in the loop about updates to events or changes to schedules. Never have your team members miss another game. Use read receipts to know exactly when your messages are received. Write news and announcements easily and share them with your entire team. Display news items in the image slider on your home page. Open forums, discussion topics, and message boards. Choose whether to allow comments, show discussions publicly, and email your team! Post your latest game scores and results in seconds. Easily track player statistics and progress throughout the entire season. Manage your team with ease! Scheduling tools to make everyone's lives easier. Set automatic email and SMS text message reminders for your scheduled events. Send messages to your players and parents hours, days, or weeks in advance. 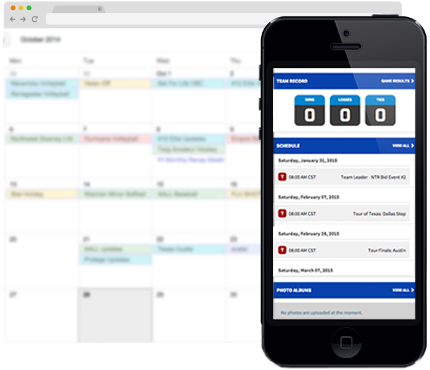 See in advance who’s coming to your game or practice and track attendance over the entire season. 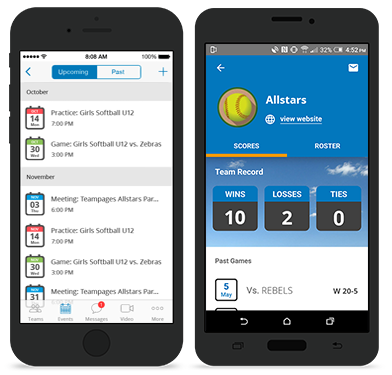 Easily sync your team’s calendar with iCal, Google Calendar, and Outlook. Whenever a schedule change is made on TeamPages, your personal calendar will be automatically updated. Simply put in the street address and location of your event and TeamPages will automatically add a Google Map to your event page. 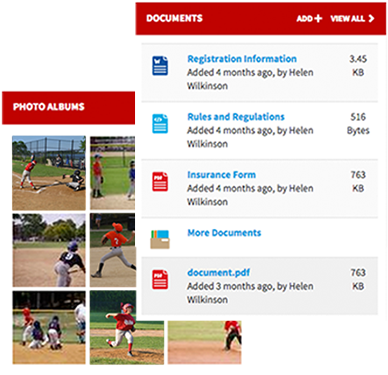 Capture your entire season and archive it for the memory bank. Parents, team members, and fans can share media easily. Upload photos and videos as well as attach files and pictures to news announcements for display in the news slider. Embed youtube or vimeo videos or upload directly onto your TeamPages site. Capture highlight footage or post instructional tips and drills. Post documents directly to your team website where they can always be found and downloaded by your members. Upload as many as you like (Word, Excel, PDF, Powerpoint, and others are all supported). It is easy to post your site content directly to your facebook and twitter feeds. Share news, photos, or videos with all your fans & followers. TeamPages is safe, private, and secure. With TeamPages you can make your team website as private or public as you want. Each one of your team members gets their own account and login password to be able to access the private areas of your website. You control who can see what on your site. Set pages and widgets to be visible by your team members only, hiding it from public view. The information your team members upload on their profiles will stay on their profiles. TeamPages is a secure community. We are here to help you with whatever you need. Have a question? Give one of our friendly customer support reps a call anytime at 1-888-543-7223. Whether it’s providing an online tutorial or giving suggestions on how to improve your site, we’re always here to help. 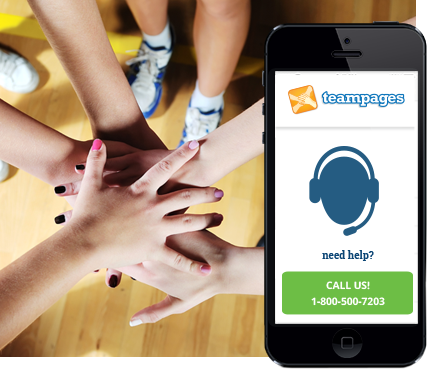 Over 50,000 teams, leagues, and clubs use TeamPages, and our community is constantly growing! You get access to our discussion forums and help site where you can interact with other TeamPages users! We love hearing suggestions from our community and providing new features. Your website automatically gets updated with the new bells and whistles each month - no maintenance needed. Got an idea for a feature? Give us a call, we’d love to hear from you.